Celebrating a 100th birthday is becoming increasingly common, especially at one Newcastle care home! Betty Carr from Gosforth has entered into a growing club because four residents at Eothon Care Home are now centenarians. Police are appealing for witnesses following a street robbery in Gosforth. A 53-year-old man was approached by two men armed with Stanley knives outside the Halifax Building Society, on the High Street, at 3.40pm on August 4. He had cash, a necklace and a watch taken from him. The pair ran to Gosforth Central Park where they met up with a third person before running away. Officers are at the scene of what police are describing as a 'serious' collision on Jubilee Road in Gosforth, Newcastle. Police have tweeted that, as a result, part of Jubilee Road has been closed, at the junction with Kenton Lane and Farnon Road. Officers on scene of a serious collision on Jubilee Rd, Gosforth. Part of Jubilee Rd is closed, junction with Kenton Lane/Farnon Rd. A man, 53, has been arrested after recording equipment was found in the toilets of a Tyneside school. The A1 Southbound entry slip road is closed due to broken down horse box at A1056 / B1318 Great North Road (Gosforth Park / Great North Road Junction). Police are appealing for witnesses after arson attacks in Newcastle. Two cars and a garage were set on fire in the early hours of November 8. All three attacks happened in the early hours of Tuesday, November 8. At around 2am, a car parked in communal bays in Penshaw Green was set on fire. At 4:30am, it was reported that another car had been set of fire on Hollywood Road, in Gosforth. A third report then came into police shortly after 4:30am about a garage in Harwood Road, Gosforth,. All of the fires were extinguished by the fire services and nobody was injured. "Enquiries are ongoing into all of these fires and to establish if they are linked in anyway. accelerant was used in all of the crimes and so we are treating them as malicious and are appealing for anyone with any information as to who is responsible to come forward and contact us." Police have made an arrest after a burglary in Gosforth, Newcastle. Officers were called to Park Avenue when a member of the public heard a window smash at 4am on October 17. They found the back window of a property had been broken and a man was inside the house. The man tried to run but was arrested on suspicion of burglary. The 18-year-old man is currently in police custody and enquiries are ongoing. Police are appealing for information after a man exposed himself at a woman in Gosforth. Between 1pm and 1:45pm on Monday, September 5, an 18-year-old woman was walking along Heathery Lane, towards Gosforth, when a man approached her on a bike. He got off his bike and exposed himself at the woman before making off. He had short brown / ginger hair and a stubbly beard. He was wearing a white Tshirt with a motif on the front and grey tracksuit bottoms. 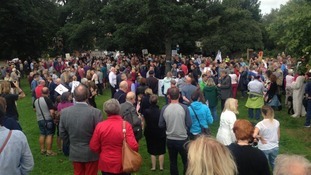 Newcastle Council have released a statement as hundreds gather to protest on Newcastle's Town Moor at plans to significantly expand the Blue House roundabout, north of the city centre. “The only certainty here is that something needs to be done. For years this junction has suffered with congestion and delays and it is the second worst location in the city for injuries caused by road traffic collisions, we have a duty to put this right. Our city’s future prosperity depends on us providing the supporting infrastructure to enable growth, and we’ve secured Government funding to invest in our transport network. To do nothing or to scrap plans that will make significant improvements is simply not an option. What we will do though, and we have said we will do all along, is to use feedback to re-shape proposals and then formally consult on these. Opponents say they are excessive, and would destroy a section of the protected Town Moor.